HomeCinemaMasalaAnother ‘Badass’ Chic Party for Priyanka Chopra and this one is Pyjama style! Another ‘Badass’ Chic Party for Priyanka Chopra and this one is Pyjama style! Well, Bollywood is abuzz with weddings around the corner. One amongst that is the impending wedding of Priyanka Chopra and Nick Jonas. The couple is tying the knot in December and before that the actress is spending some special moments with her girl gang. Before returning to Mumbai for Diwali celebrations, Priyanka decided to continue with her pre-wedding bashes with the ladies. And after a bachelorette and bridal shower, here was the ‘badass’ pyjama party. Cousin Parineeti Chopra, who has been a part of almost all these bashes, decided to share about this pyjama party on social media. Parineeti shared the picture of all of them dressed in baby pink pyjamas and the guest list also included some of Priyanka’s closest friends like Isha Ambani, Nick Jonas’ sister-in-law Sophie Turner amongst others. 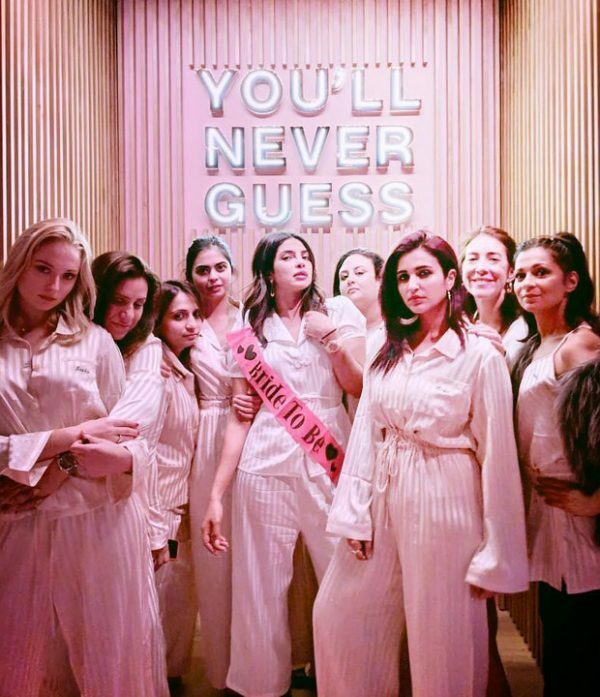 Parineeti Chopra called this as the ‘Badass Pyjama Party’ whereas Priyanka Chopra too shared a couple of pictures with the same, ‘You’ll Never Guess’ backdrop. She captioned the same saying, “Payjamas are cool.. #bridesquad #payjamasandheels ?? @tam2cul @srishtibehlarya @daniellejonas @mubinarattonsey you were missed.” Well, we must say the actress is having gala of time before tying the knot one month from now. Priyanka Chopra has now returned to India after all the parties where she spent quality time with her family which included her mother and brother. As for her wedding, after an engagement in August this year, the actress is tying the knot on December 1 and 2 in a lavish Indian style wedding in Jodhpur, Rajasthan. Kangana Ranaut has a fun-filled Diwali with family and this is proof!